Name Michael at Onomast. What does name Michael mean? Meaning, origin, translation, rating, popularity, code, gender and comments of the name Michael. Hugely popular English name, derived from Greek name (Μιχαήλ) [Mikhail], from the Hebrew Mikhael, comes from the Hebrew words (מִי) [mi] - "who" + (כְּמוֹ) [kemo] - "like, as" + (אֵל) [El] - "God"= "the man who is like God; who is like God (Yahweh)". 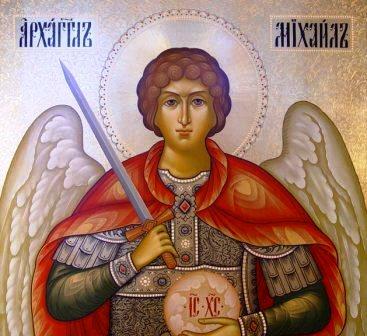 The Archangel Michael is one of only three angels that are named in the Bible (the others being Gabriel and Lucifer) the original name of Satan / The Devil). We are told that he is one of the chief princes, 'the great prince', a mighty warrior and leader of other angels. He is God's enforcer of law and judgment and is the only angel specifically called an archangel in the Bible. Michael appears to have a special role in guarding the nation of Israel and the Jewish people. In Jewish tradition, Michael is the author of Psalm 85, which is a sad poem about the suffering of the nation of Israel. He has also been associated with the man who spoke to Joshua at the battle of Jericho. In his role as chief warrior angel, it could well Michael's voice that announces the return of Jesus to earth. It is thought that is was Michael who fought with, and threw out the Devil/Satan/Lucifer from Heaven (when the Satan revolted against God and tried to take God's place) and that Michael became the 'top angel' in the Satan's place. He is often depicted wearing medieval armour, ready for battle - very appropriate for his warrior role! In the Catholic tradition, Michael is said to have appeared to Mary (Jesus' mother) to tell her that she would die soon and that he carried her deceased body into heaven.